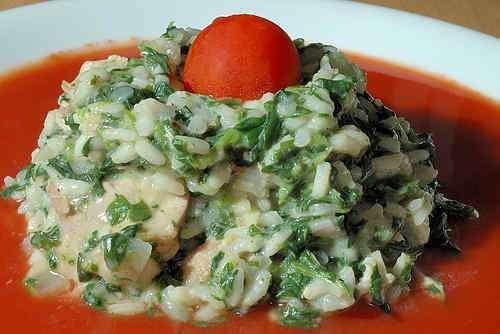 A flavorful risotto with chicken, spinach and yogurt or kefir to add some tang. Simple, elegant and fast to prepare. Set sauté pan over medium-high heat. Add oil and brown chicken thighs from all sides. Remove thighs and set aside. Add onions and salt to pan and cook until soft and translucent. Add garlic (retain 1 tsp of raw garlic). Cook for a minute or two. Add rice, cook until translucent. In separate pan, bring chicken stock to a simmer. Return chicken thighs to pan with rice and onions. Slowly add hot chicken stock, stirring frequently. Add white wine. Simmer over low to medium heat until rice is done. Stir frequently, also turning the thighs. Remove chicken. Stir in chopped spinach and remaining raw garlic. Cook for another 5-10 minutes until spinach is done. In the meanwhile, bone and cut up the chicken. Stir in yogurt or kefir. Return chicken pieces to pan, heat up for a few minutes. Season risotto with salt and freshly ground pepper. Serving suggestion (as in photo): Stack risotto in the center of a plate and top with half of a cocktail tomato. Pour tomato or vegetable juice around the risotto. All original content of this site is licensed under a Creative Commons Attribution-Noncommercial-No Derivative Works 3.0 United States License. Attribution for photos should be provided by linking back to this site or the specific recipe page or by referencing this site.